Journal Club - Early Retirement | Passive Income M.D. 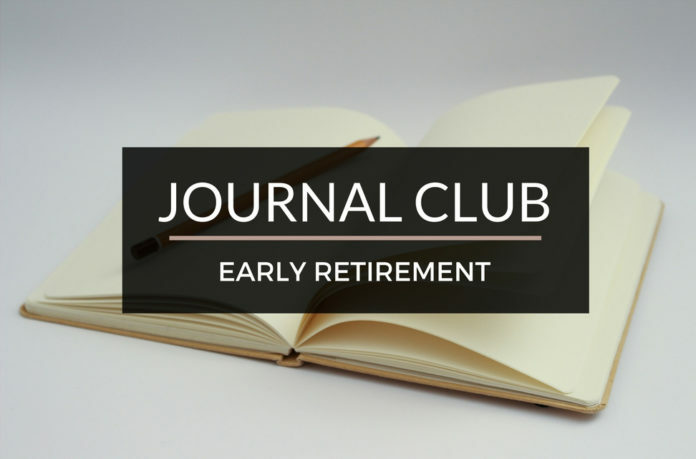 Every couple of weeks, I plan on holding a JOURNAL CLUB. We’ll pick a topic, and after manually filtering through the millions of articles out there, I’ll present a few that I think are extremely helpful. This will help lay the foundation for some of the topics that we’ll dig into on this website. While there are many ways to carve up this subject, for this edition, I wanted to find different examples of exactly what the game plan is for some of my fellow bloggers. While I believe retirement looks different for everyone, if you don’t have the end goal in mind, it’s really hard to make sure you’re on the right path. Each of these posts not only have a finish line in mind, they’ve actually tried to figure out how to get there on paper. As you follow me on this blog, you’ll be able to see my journey unfold. My end goal is clear and I’m trying to get there by replacing my current income with side passive income streams. Let’s start with how a fellow anesthesiologist, Physician on Fire, actually achieved financial independence in My Path to Financial Independence. Another fellow M.D. blogger, Future Proof, M.D. outlines his current plans for retirement. Investing For Retirement, The Future Proof Way. How Dr. Wise Money, a radiology resident, shares her plan to be financially independent by age 38 in How I Can Retire at 38, But Won’t. A radiology attending and family man, Senior Resident, gives us his take on retirement in Retiring Early and How to Retire Early. While it’s not exactly his own game plan, hear the White Coat Investor tell us How To Punch Out of Medicine in Ten Years. Budgets are $exy goes all out, breaking down his retirement plan on Excel in The Early Retirement / Financial Independence Spreadsheet. I like the way Retire by 40 lays out his early retirement plan in Early Retirement Checklist. Read how this married couple, simply known as Our Next Life, is on the verge of early retirement (at ages 38 and 41), in Our Early Retirement Vision. So between patients, between cases, or while waiting for that next admission, take a few minutes to read these, it’ll be worth your time. Feel free to drop some thoughts below… inspired at all?